The magnetic field required for the operation of a d.c. generator is produced by an electromagnet. This electromagnet carries a field winding which produces required magnetic flux when current is passed through it. 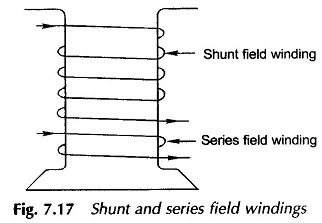 Note : The field winding is also called exciting winding and current carried by the field winding is called an exciting current. Thus supplying current to the field winding is called excitation and the way of supplying the exciting current is called method of excitation. In separately excited generators, a separate external d.c. supply is used to provide exciting current through the field winding. The d.c. generators produces d.c. voltage. If this generated voltage itself is used to excite the filed winding of the same d.c. generator, it is called self excited generator. Expression For Back E.M.F Or Induced E.M.F. Per Phase In S.M.